The main edit window consists of the address pane and three editing panes – the Hex pane and the optional ANSI and UNICODE panes. 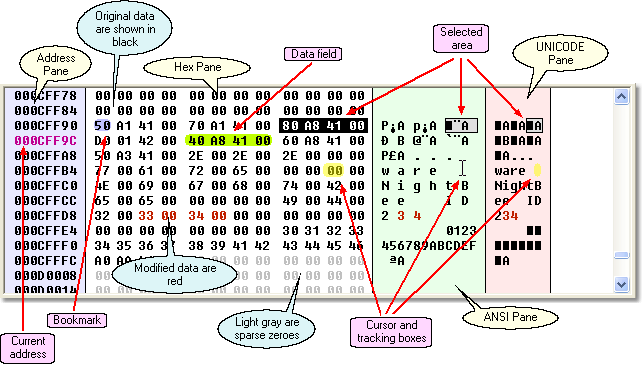 The address pane contains a list of hexadecimal numbers, which are the addresses of the corresponding lines of data. What we call addresses are actually offsets in the file being edited, although in few rare cases addresses and offsets might differ. The current address is shown in a different color and represents the input caret position. In order to learn the decimal value of the address, point the mouse cursor to it and the Quick View window will open. The Hex pane and the optional ANSI and UNICODE panes display the data being edited. All of them represent the same data, and are, in fact, just different views of the data. Any change in one of the panes is immediately reflected in other panes. You can make a pane active by clicking the left mouse button inside the pane, or by cycling through the panes with the Tab or Shift-Tab keys. Some objects, namely bookmarks and data fields are shown in the Hex pane only. The selection area is shown in all the edit panes. When you copy data to the clipboard it is important which panes is currently active. The Clipboard and Drag-and-Drop topic contains a more detailed discussion of the data copy and paste operations. The last point worth mentioning is the cursor tracking boxes. When you move the cursor in a pane, you may notice yellow boxes following the cursor in other panes. As already mentioned before, all the panes show the different views of the same data and the tracking boxes help you see the correspondence between different data representations.